Music is an important part of the worship service at First Presbyterian Church. 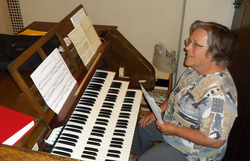 Julie Hart is our organist and choir director. The choir meets Wednesday's at 7:00 in the lounge. Anyone who is interested in becoming a part of the choir is welcome to join in. The choir sings all but one Sunday on most months during the year. On the Sunday's that the choir doesn't sing special music is provided by a church member or guest. If you are interested in providing special music or would like more information or a choir schedule please contact the church office.